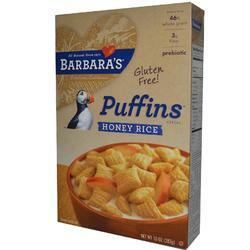 shop Barbara s Bakery Honey Rice Puffins 12x10OZ | bargainbrute. All Natural Since 1971 - Enhances Calcium Absorption, Reinforces Immunity, Promotes Healthy Digestion. Benefits Per Serving:46% Whole Grain3g Fiber,Prebiotic, Gluten Free!. Natural Cereal Nourishes Balanced Lives.Balancing the crunchy, sweet goodness of toasted whole grain brown rice puffs and the rich, deep amber of real honey makes for a truly delicious cereal. They are a natural pair loaded with the nutrition you need to keep active and stay healthy. Plus, they are free of artificial flavors, preservatives or additives - because that's Barbara's way.Honey is the original all natural sweetener.